To get started in Triathlon, all you need is a bathing suit, goggles, bike, and running shoes. Like any sport, as athletes progress into development and performance level programs, specialized equipment may be required. This is always a challenge for parents of younger athletes, as the costs can add up (not to mention the kids grow out of their equipment quickly). PARENTS - KRONOS WORKS HARD TO MAKE TRIATHLON MORE ACCESSIBLE AND COST EFFECTIVE FOR OUR FAMILIES! Future Champions Program - Low Cost Acccess to High Performance Bikes! Update as of November 1, 2018: We still have a limited number of road bikes available for younger athletes. Please contact our Head Coach at kyle.jensen@trikronos.com OR 403-593-1530 for more information. 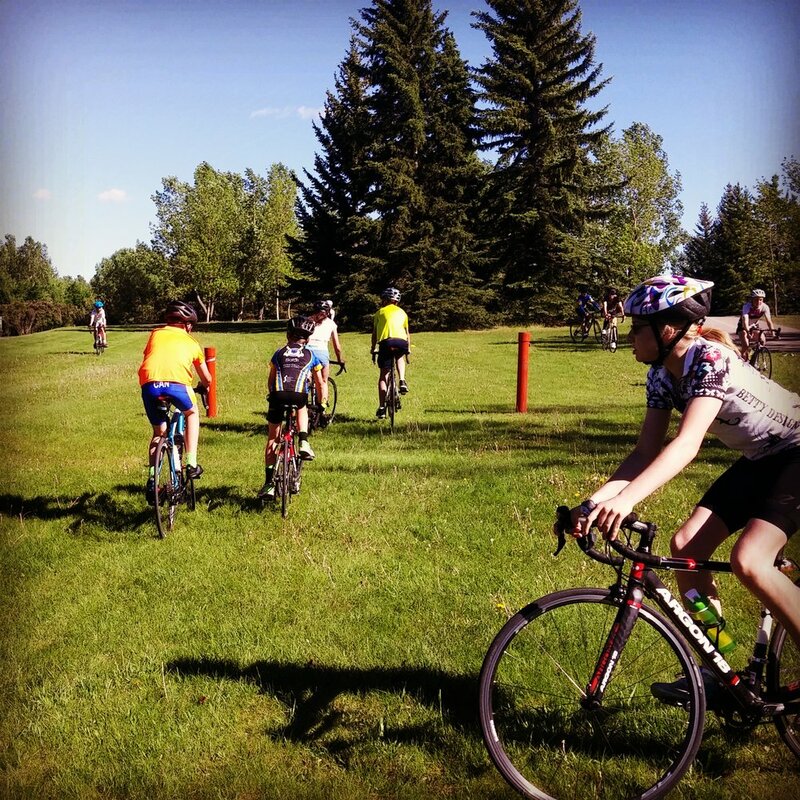 Kronos is proud to partner with Argon 18, Speed Theory, Ironman 70.3 Calgary, and Chinook Triathlon Festival, and bikeforkids.ca to provide our Youth Development, Youth Flex and Jr Performance athletes with low cost access to high performance road bikes. The bicycles are rented out for the full training season at a cost of $150 (compare at $150/week at most bike shops), providing athletes with an opportunity to train and race with top end equipment. Many of these bikes come in hard to find child & youth sizes. The club also offers hard to find stationary trainers for 24” wheels at a rental rate of $25/season. Please click HERE for the Future Champions application form and additional details related to this program. Our coaches have hand-picked the most appropriate swim gear and it can be purchased on-line or in-store with exclusive Kronos discounts. Please CLICK HERE for details about our Team Aquatics Shark Card program. Time to time through the year, Kronos will arrange to purchase of swim bags, swim suits, outerwear (hoodies, toques, hats, t-shirts), race suits, cycling gear and various other items customized with club colours & logos. Through bulk purchases, we are able to provide these high quality customized items at a very reasonable cost to club members. Click here to visit our on-line store! Sales for the 2018/19 season open Oct 14. Kronos has partnered with many local bike, swim and run shops to provide generous discounts to our members. We also arrange discounted group purchases for things like bike trainers, race suits, swim caps, and other gear. Kronos also has relationships with several fitness technology manufacturers who generously donate cutting edge demo equipment to the club. Even basic maintenance on a bicycle can be costly and intimidating for those who are new to cycling. To help with this, Kronos arranges FREE courses that teach basic bicycle maintenance. Athletes and parents are invited to learn how to maintain their bikes, fix flat tires, and do basic safety checks. It's very common for growing athletes to pass down training gear, and to see bikes or other big ticket items sold between club members. Free Stuff at Race Events! As you spend more time around triathletes, you will no doubt see them with all sorts of T-shirts, water bottles, backpacks and other sports equipment - all featuring race names and sponsor logos. This is one of the best perks in Triathlon, as nearly every races hands out free stuff to participants! It's also quite common to win prizes at events. Our race alone (Kinetico Calgary Kids of Steel) will hand out nearly $10,000 in free gear and draw prizes!